The LC 480 is a plate-based machine that comes with two exchangeable thermal blocks, one with 384 wells, the other with 96 wells. Both thermal blocks are fast-cycling, meaning that typical run times are slightly under one hour. The range of reaction volumes is 20 - 100 microliters for the 96 well block and 5 - 20 microliters for the 384-well block. We have had good success running the 384-well block with reaction volumes of 10µl, which leads to significant savings in reagent costs. 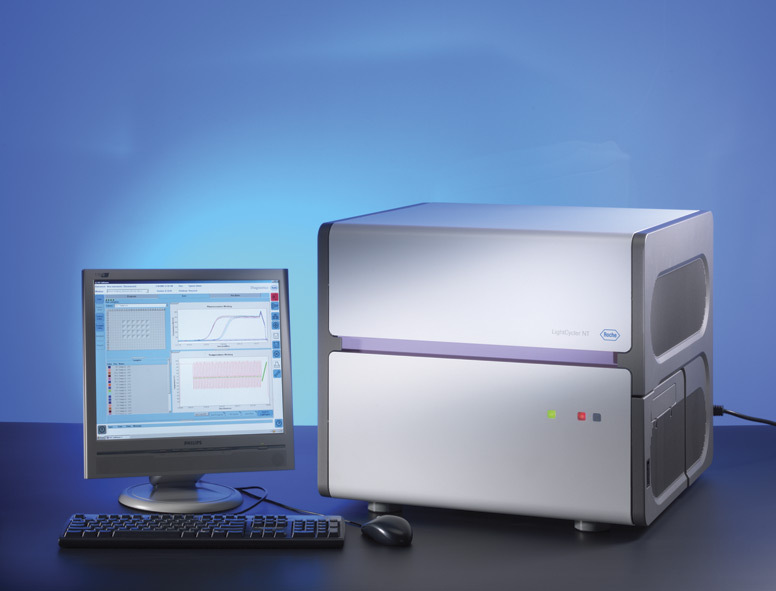 The LC480 uses a Xenon lamp as its light source and has a number of possible excitation/emission wavelengths to choose from, making multiplexing much easier. Below is a table listing the center wavelengths of the filters in the machine. The excitation/emission filters can be set independently. Examples of Compatible Dyes LightCycler (LC) Cyan 500, SYBR Green, FAM, TET, HEX, VIC, TAMRA, CY3, LC RED 610, LC RED 640, CY5. The LC480 can measure more than one fluorescence wavelength per well. This means that endogenous controls can be run either as parallel reactions in separate wells or within the same well as the sample (multiplex PCR).